MBIR San Antonio is a 501 (c) (3) non-profit organization. All donations are tax-deductible. Click donate button for online donations or mail payments to MBIR of San Antonio TX, P.O. Box 769116, San Antonio, TX 78245. Make checks or money orders payable to: "MBIR of San Antonio TX"
​Please choose "Add special instructions to the seller" and insert your donation purpose, or leave blank for "General". Special Donations: As needed requests for support. Indicate what you are supporting. 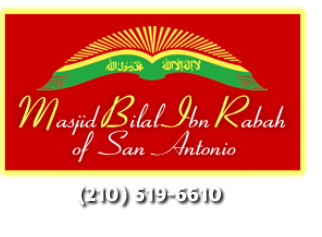 For questions, contact Masjid Bilal Ibn Rabah at (210) 519-6610. Thank you and ​Allah (G-d) bless you for your generosity.